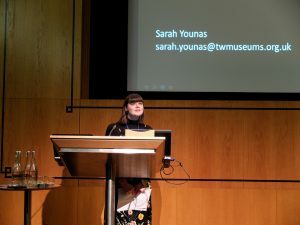 I was thrilled to be selected to attend the Museums+Tech conference this year, having just completed a Masters dissertation focusing on the value of online audiences and the role digital engagement plays for museums. The immense range of subjects, ideas and projects discussed by the fantastic speakers highlighted how broad digital technology within the museums sector really is. It is much more than just touchscreens and Facebook Live campaigns – advancements in the digital world have opened up so many opportunities for museums to share the stories of their collections. From apps to interactive websites to geotagging; what became clear is that the ever developing world of digital is bringing evolving and exciting opportunities for museums to engage in new ways with their audiences. However, discussions amongst the delegates over lunch and via Twitter raised the reoccurring question of how museums incorporate these new technologies and programmes into their management and budgets. Smaller museums that are running on a shoe string and two members of staff can’t afford the time or resources to take on new initiatives. And while the ideas and desire may be there, the skills base, funding and time required to do it just can’t keep up. It was therefore reassuring to hear from many speakers who have faced these predicaments and have managed to create solutions that work for their institutions. The positivity and determination of these stories suggests that while delivering large digital projects may often seem like a pipe dream, some clearly defined goals and a bit of clever thinking can make versions of these dreams come true. Trial and error and concept testing were repeated themes of the day and beautifully summed up Sarah. Pursuing ideas and being willing to make mistakes and learn is something that Tyne and Wear are clearly doing very well and it shows in their successful digital work. Their collaborations with community members, non-digital staff and external experts shows they are testing new ideas and seeing where it takes them. I think everyone left the conference with a new burst of energy to try new things and see where the digital world can take them and their online audiences. And I can’t wait to be involved in this progress – the future of digital in museums is looking exciting!